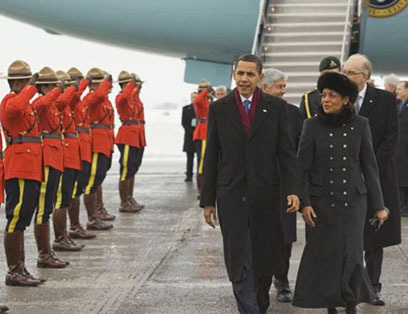 President Barack Obama is welcomed to Canada by Governor General Michaëlle Jean and a contingent of Royal Canadian Mounted Police, February 19, 2009. Bizarre or otherwise, it seems to us that this debate just may mark the beginning of some kind of more or less serious public conversation on the future of the British monarchy in Canada. And this could be a good thing to converse about at the moment, since anything practical that might result will cost virtually no money at all. 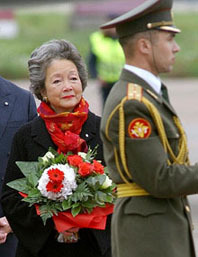 Adrienne Clarkson, Governor General of Canada, 1999-2005, referred to herself in office as a “head of state” in 2004. Here she is arriving on a controversial $1 million trip to Russia in September 2003. The late Romeo LeBlanc, Governor General of Canada, 1995–1999, referred to himself in office as a “head of state” in 1999. 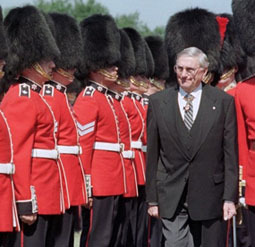 Here he performs his annual inspection of the ceremonial guard at Rideau Hall on June 22, 1999. WHAT DO CANADIAN REPUBLICANS REALLY WANT? Randy Boswell has done yeoman service reporting on the great debate for Canwest News. But he gets at least one thing quite wrong, again as best we can make out. In his October 10 summing up, “Head-of-state debate makes for bizarre spectacle,” he aptly notes that: “Just as the uproar has prompted monarchists to urge renewed recognition of the Queen’s key place in Canada’s constitutional monarchy, others see the dispute as a good reason to eradicate all vestiges of the British-based Royal Family from Canada’s political order.” But in enumerating these others he goes on to say that still “Others are keen to see both the Queen and her Canadian viceroy dumped in favour of a single, elected, presidential-style prime minister who serves as both head of government and head of state — the long-sought goal of Canada’s considerable contingent of republicans.” This is not at all the goal of most of the considerable contingent of Canadian republicans we’ve ever met. See, e.g., the Wikipedia article on the organization known as Citizens for a Canadian Republic. A CONSTITUTION SIMILAR IN PRINCIPLE TO THE UNITED KINGDOM. The Constitution Act 1867 still says that Canada is to have “a Constitution similar in Principle to that of the United Kingdom.” It is a key feature of this kind of constitution that it has important “unwritten” as well as “written” parts — and its unwritten parts evolve by precedent and practice over time, to keep up with changing circumstances. We often forget that the UK Constitution we in Canada, so to speak, inherited in 1867, has been evolving since then too, in its own right. Does this mean that we must follow the UK constitutional evolution since 1867 too, just as we must follow the British monarchy? In any case, for an interesting discussion of recent developments in this department see Stephen Sedley. “On the Move” [A review of The New British Constitution by Vernon Bogdanor], London Review of Books, 8 October 2009.